The Yelp is one fast stroke made by pulling the lid very softly 3/4" to 1" across the side (sounding board) of the box. The yelp is simply one note in turkey language which forms the basis for all other calls. 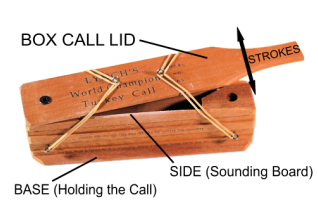 The Tree Call consist of 2 to 3 very, very soft strokes, approximately 1/4" to 1/2" across the call side of the box. Usually the first sound made by hens in the morning, the tree call can be used to entice the gobbler to fly down in your direction. The Mating Call consist of 3 to 5 soft, fast 3/4" to 1" strokes, can also be used to entice the gobble to fly down in your direction 15 to 30 minutes after daybreak. It is good to use any time of the day as a locator call. The Assembly or Lost Call is a series of 10 to 15 strokes 3/4" to 1", varying in sound from soft to loud back to soft. It is a good locator call and a good call to use in the fall. The Cluck is made in 1/4" strokes, made very softly and using a lifting motion. NOTE: Most of the calls made on a box require the lid never leaving the surface of the sounding board (side). The cluck and some variations of the cackle are the only calls that require the lid to move away from the side of the box. The Whine made by one very, very low, soft 1" stroke is used in combination with 2 to 3 clucks to bring gobblers into gun range. Cackles are made by making 5 to 8 rapid 1/4" strokes, tapering off into 3 to 5 slower 1" strokes in a continuous rhythm. The cackle is very effective in early morning as a locator call. Care of the Box Call includes replacing rubber bands with size #18 when elasticity lessens, keeping the underside of the lid well chalked with nontoxic oil-free dust chalk and protecting the call from excessive moisture and heat; do not leave on the dash of a vehicle for extended periods of time.